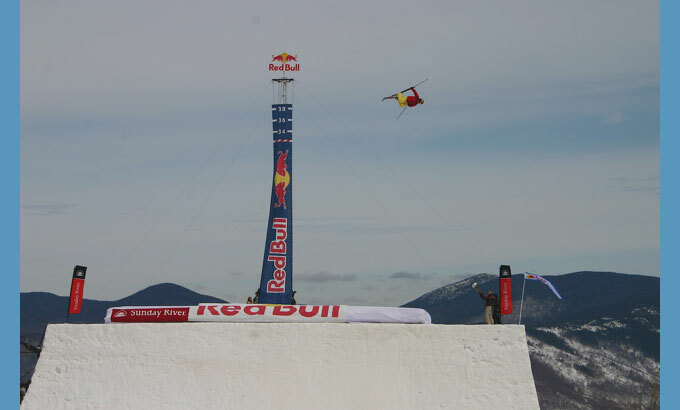 Skiing prodigy and X Games star Simon Dumont accomplished the unthinkable April 11, 2008, establishing a world record for highest air on a quarterpipe as he launched 35 feet into thin air at his home resort of Sunday River in Maine. The encore event was The Dumont Cup at Sunday River where Simon hosts a pro am show down throwdown! On the world’s tallest quarterpipe (38-feet tall and 78-feet wide) custom-built by Snow Park Technologies, and with a representative from FIS appointed by Guinness Book of World Records on location to document the record-breaking moment, Dumont beat previous record holder Terje Haakonsen’s 32 feet 6 inches on April 11, 2008. Soaring a breathtaking 73 feet above the ground — more than a seven-story building — this hometown hero sent the intimate crowd of family and friends into a frenzy as they witnessed the record-breaking moment. 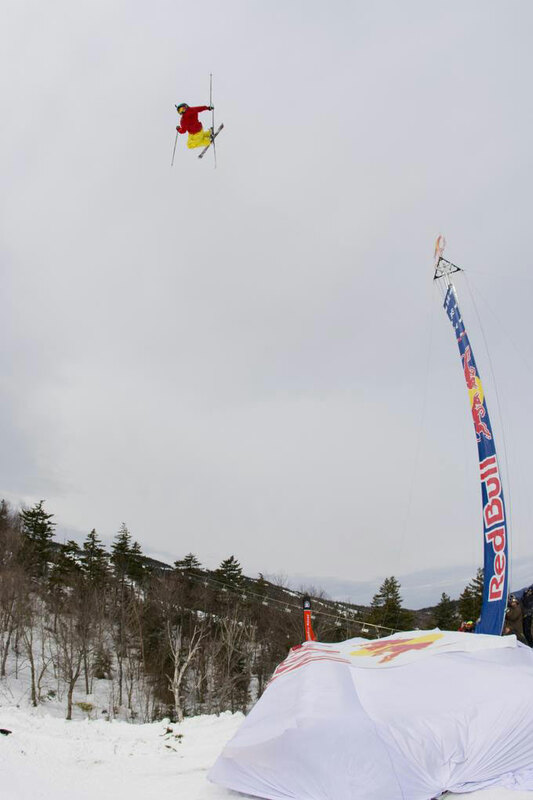 The Red Bull sponsored event began Tuesday morning when Dumont arrived on site directly off a flight from Sweden. 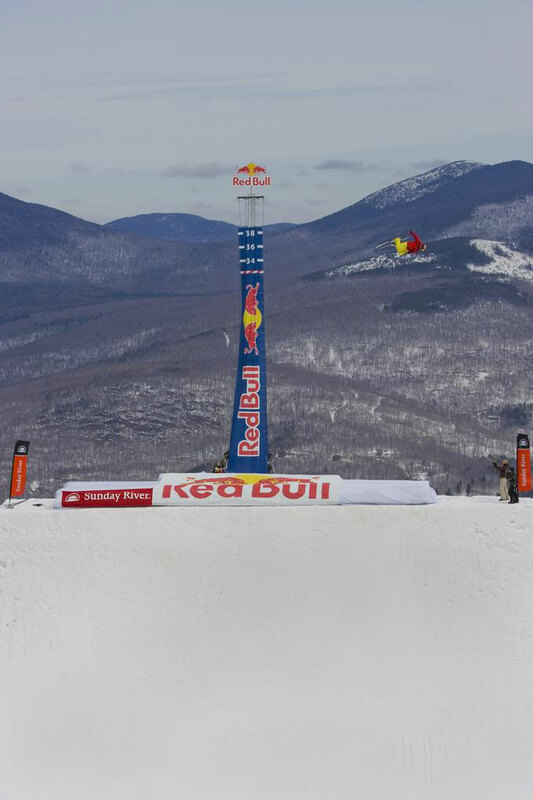 Dumont began hitting the quarterpipe in the early afternoon when he reached heights as high as 28 feet, before drifting in the air and falling nearly 66 feet onto the snow below. Dumont’s hard hitting landing caused him to bruise his heel and aggravate an existing knee injury. After seeing the doctor, Simon returned to the hill on Wednesday, but was plagued by his injuries and was forced to recuperate for the rest of the day. Thursday was disrupted by high winds forcing the entire staff to delay their flights in order to provide Simon with one more opportunity to attempt the World Record. At 9 a.m. Friday morning Simon showed up with his game face on and was ready for his final attempts. After an hour of repeatedly hitting the quarterpipe, at 10:12 a.m. Dumont hiked an additional 15 feet up the hill to gain more speed. Simon crouched into a tucked position going 55 mph down the in-run and not only launched 35 feet into the air, but spun a 900 in the process. How appropriate that this history-making moment was at Sunday River, New England’s premier ski destination located in the Mahoosuc Mountains of western Maine, where Simon grew up skiing and jumping!